House Wrens are Cavity Nesting birds found in the northern two-thirds of the United States. House wrens are probably the easiest cavity nesting birds to attract to nest boxes (bird houses). 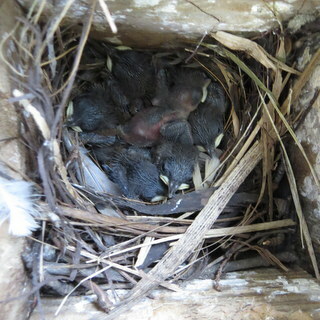 They can nest in a nest box with a hole size of 1-1/8 inches. This size excludes House Sparrows, an aggressive alien species that competes with our native cavity nesting species. Unfortunately a hole size of 1-1/8 inches also excludes bluebirds, tree swallows, and titmice; desirable native species that readily nest in birdhouses. But even native birds compete with House Wrens for nesting sites. The best nest box hole size for the House Wren is 1-1/8 inches. This size allows House Wrens to enter while preventing other competing species from entering. Putting up a nest box for House Wrens will likely entice them to nest. I'd suggest placing more than one nest box as any extra nest boxes can be used by Black-capped Chickadees or other House Wrens. House Wrens prefer a nest box that is mounted at least 5' high in an area near trees or shrubs. They will not nest in a location that is lacking trees/shrubs. The method of mounting your nest box is as important as the design of the nest box. Mounting to a tree or wood post is not a good idea, as predators will be given easy access to the box. Furthermore a nest box mounted on a tree is difficult and dangerous to monitor. A much better technique is to mount the box on a 5' metal pole or a 10' telescoping pole. Both species will destroy the nests and nestlings of House Wrens. But due to the House Wren's small size, the size of the entrance to the nest box can be made small enough to prevent House Sparrows and European Starlings from entering. The European Starling and the House Sparrow can be prevented from entering their nest boxes by using a 1 1/8" diameter entrance hole. If a 1 1/2" hole is used, house sparrows will enter and drive the House Wrens away. A 1 3/4" hole will allow European starlings to enter. 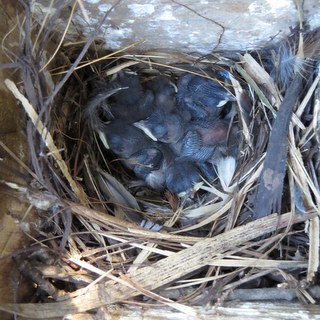 You may choose to control House Sparrows and European Starlings to benefit other cavity nesting birds. 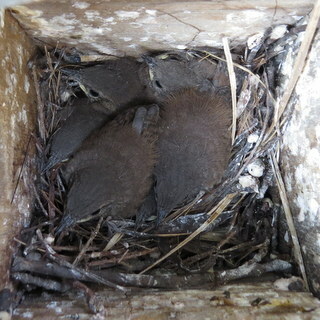 House wrens are one of the easiest cavity nesting birds to entice to nest in a nest box. 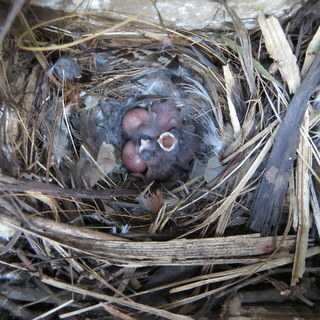 I've had them nest in nest boxes designed for bluebirds having a 1-1/2" hole. 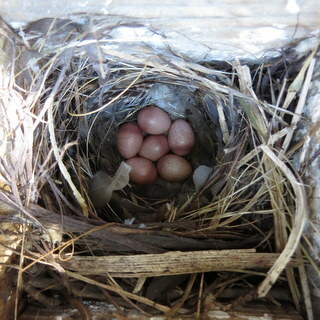 But sometimes their eggs would disappear or they would abandon the nest box. For them to have the greatest success it is important to use a 1-1/8" entrance hole. This prevents larger birds from competing with them. In 2017 I decided to put 1-1/8 hole restrictors on some of my bluebird nest boxes. After doing this, the house wrens had a much better success rate. The following pictures are from a 2016 nest. Six house wrens fledged from this nest. Every year I have at least one pair of house wrens nest in my yard. In the process I have learned a few things to help them to succeed. 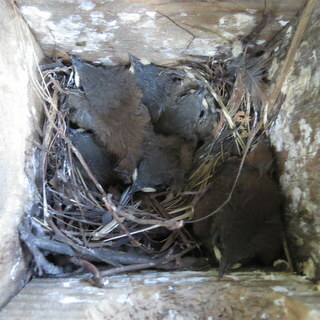 I used to think that a nest box could have a 1 1/2" diameter hole and be used by house wrens. This is partially true but the wrens may build a nest but other birds such as house sparrows can also enter the nest box. These larger birds will destroy the wren nest. In 2017 I had an entire nest full of chicks die. I think they had a mite infestation.